The National Pest Management Association was established to support the pest management industry's commitment to the protection of public health, food and property through continuing education of pest management professionals and the dissemination of timely information to homeowners and businesses. 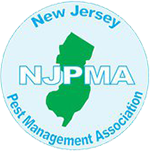 The New Jersey Pest Management Association and its members are trained to bring you the most comprehensive treatments using the latest technology. We use Integrated Pest Management (IPM) to deliver the most effective treatments and achieve the highest quality results you deserve. We are a top-rated member of Angie's List and a Super Service Award recipient.